Western Australia is a state rich in mineral, oil and gas resources. With a thriving agricultural sector and a growing population, it is experiencing increasing levels of urban and industrial expansion. The challenge is to develop the State’s resources while minimising adverse impacts on the environment. The State has eight out of Australia’s 15 declared biodiversity hotspots and one of the highest rates of new species discovery in the world. Due to the vastness of the State, rich biodiversity and a finite research capacity, there is a gap in knowledge about many species and ecosystems. Relevant, timely and coordinated research effort is needed, along with better access to shared scientific knowledge. This will enable government, industry and community to make better decisions about conservation and economic development. As science research brokers, we enable strategic partnerships between industry, government, community and researchers to help enhance scientific knowledge and improve biodiversity outcomes in Western Australia. We are funded by the Department of Jobs, Tourism, Science and Innovation to coordinate a more collaborative research effort across Western Australia and reduce duplication whilst improving the level of biodiversity knowledge. Our partners include all the leading research institutions in Western Australia so we can provide the best biodiversity science expertise. 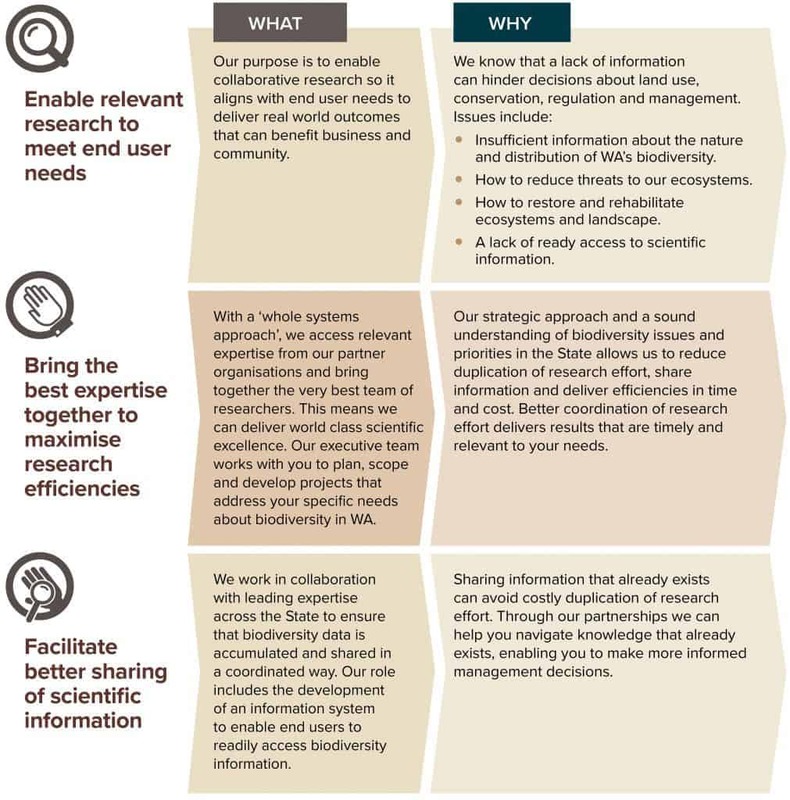 We connect biodiversity science researchers with end users of science so that research can be undertaken when and where it is most needed and biodiversity information can be readily accessible to enable informed management and policy decisions.